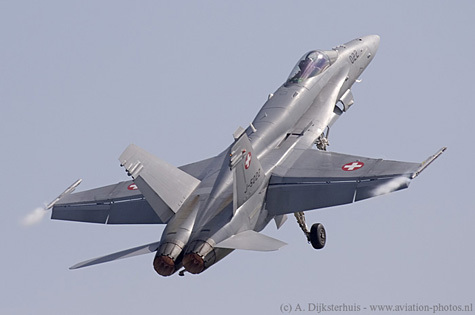 Swiss Air Force F/A-18C, serial J-5022, is seen here with full afterburner at the beginning of the display. The aircraft is assigned to Flieger-staffel 11 and flown by Captain Reiner. 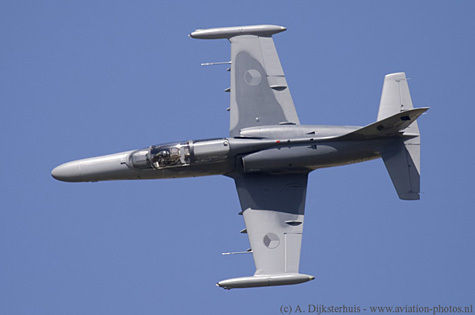 A price winning display; the Paul Bowen Trophy was awarded for the best solo jet demonstration. Another aircraft with full afterburner in take off is seen here; an USAF B-1B with serial 85-0061/DY. Unfortunately, the display was short; only two passes were made. Another example was present on static display. 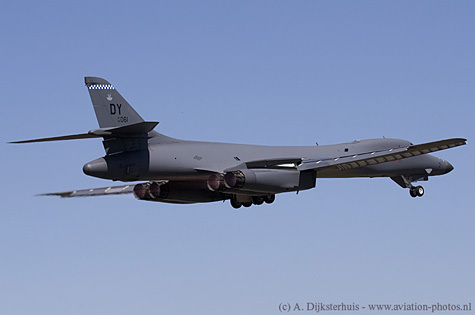 Both bombers are based at Dyess AFB, Texas and operated by the 7th Bomb Wing. 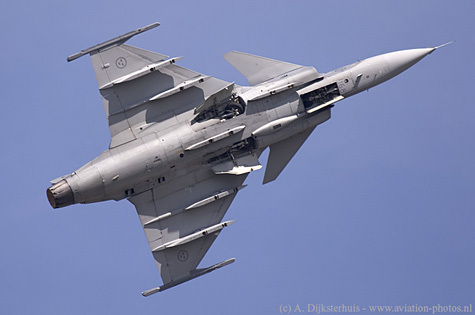 Two Typhoon displays could be seen on both days during the weekend. The, Steedman Display Sword award winning, RAF Typhoon display flown by Squadron Leader Matt Elliott from No.29(R) Squadron, RAF Conningsby, and from his Spanish collegue from Ala 11, which is seen here flying the C-16 Typhoon with serial C-16-26/11-06. 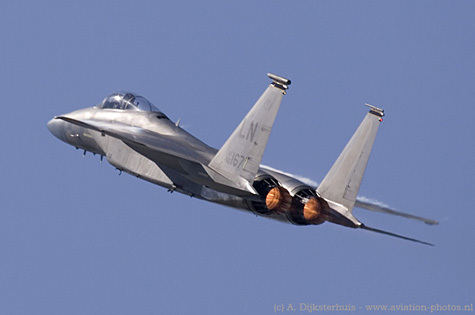 The F-15C West Coast Demo Team performed a display on both days. They didn't bring their own aircraft, but borrowed an F-15C, the 86-0167/LN, from the 48th FW based at RAF Lakenheath,UK. Definitely the highlight of the weekend; the Bell-Boeing MV-22B Osprey, a multi-role combat aircraft with tiltrotor technology, combining the vertical performance of a helicopter with the speed and range of a fixed wing aircraft. 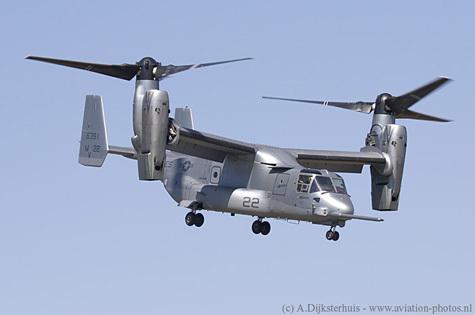 MV-22B, 166391/MV-22 is seen here hovering. 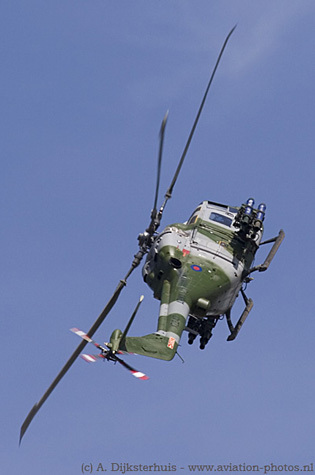 Another example was present on static display. 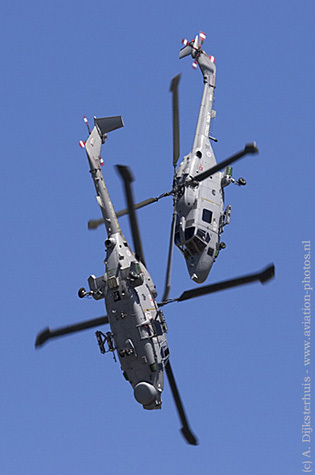 Both aircraft are assigned to VMX-22, based at MCAS New River, North Carolina, USA. The Mig-29M(OVT) with serial 156, owned by the Russian Aircraft Corporation, received two awards; the 'King Hussein Memorial Sword' for the best overall flying demonstration and the 'As the crow flies' trophy. 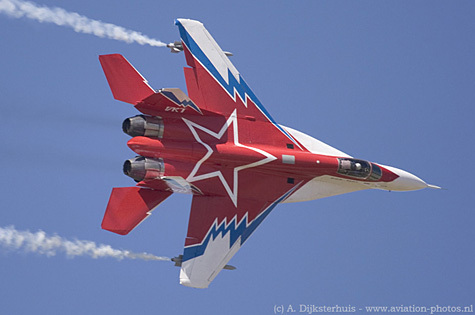 The crew, Pavel Vlasov and Mikhail Belyaev, surprised the crowd with manoeuvres that they probably never saw before. 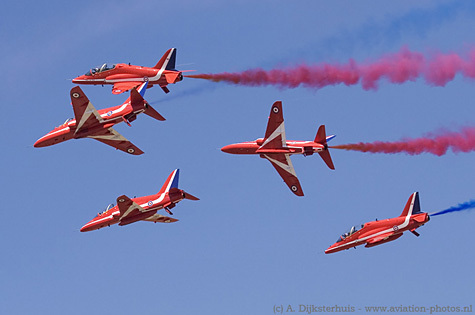 Several international display teams performed during the RIAT; one the left the Red Arrows. 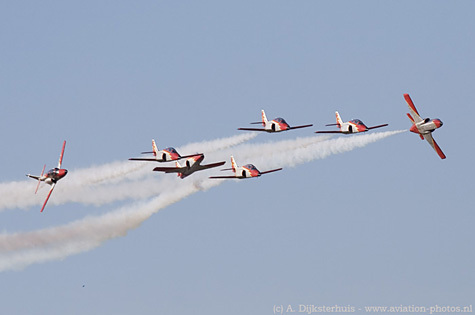 on the right (above) the Spanish Air Force demonstration team Patrulla Águila which celebrated its 21st anniversary this year. The Patrulla Águila operates seven CASA C-101EB Aviojets. On the right the Patrouille Suisse, seen here in formation with a Pilatus PC-21 while banking away from the public after a formation pass. The Patrouille Suisse wasn't the only team flying in formation with another aircraft; the Red Arrows made a pass with a VC-10 in the lead (VC-10, XV104, based at nearby Brize-Norton). 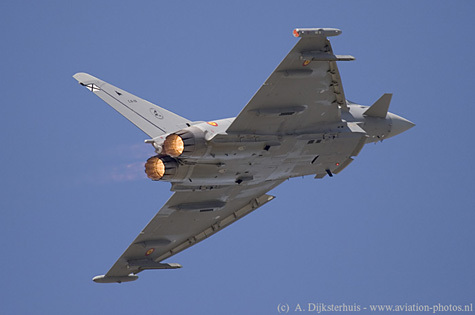 A Spanish Air Force Typhoon flew in formation with the Patrulla Águila. 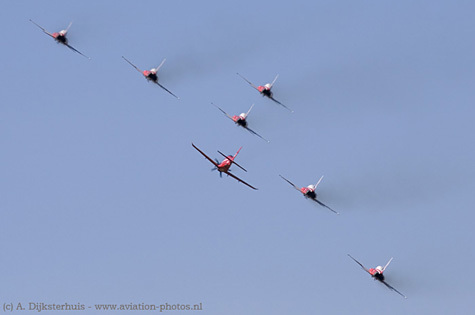 The Royal Jordanian Falcons were also present but they are not shown here. 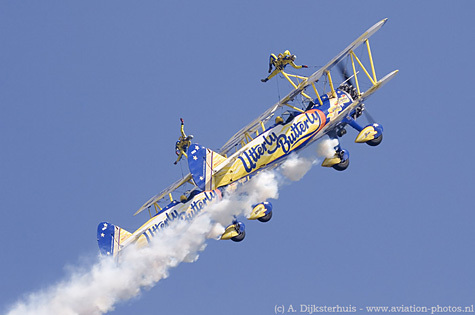 Between the fast jet displays and the helicopter displays, the organisation reserved some time for the Utterly-Butterly team, a formation flying wing walking team flying with two Stearmans. 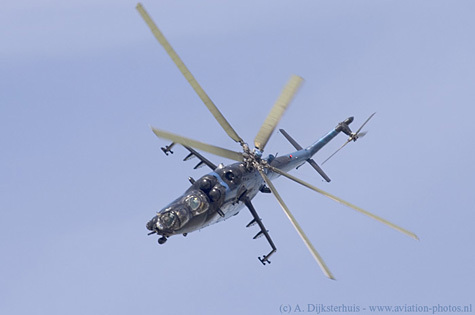 Besides of the Russian Mig-29M(OVT), another Russian product, a Mi-24V helicopter from the Czech Air Force also flew a display on both days. 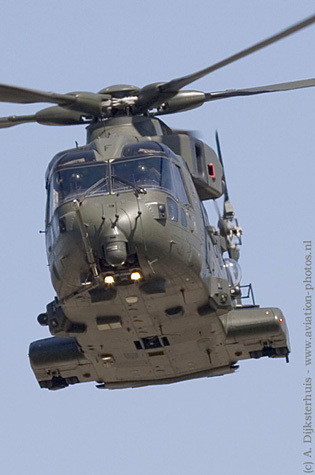 The 'Hind' with serial 7353 is still wearing the livery applied for the NATO Tiger Meet 2005 which was held at Balikesir, Turkey between April 29th and May 9th.